Team EDT Tahiti . . .
Last year, Travis Grant visited. I’ve been privileged to watch him evolve into a World Champion OC and SUP paddler since being a junior aged paddler with Outrigger Australia on the Gold Coast. We’ve raced in crews together in the past and share a love for ‘thinking’ about how to become a better paddler, rather than just smashing strokes out, but if all else fails you, that’s always an option. We got around to discussing the ‘Tahitian Stroke’ and his work with John Pukea of which he was very enthusiastic. Travis Grant. One of the world’s best relaxing at our home in the UK. He’s contributed and featured in many of my books - even before he became a house-hold name. He’s on the cover of at least 3 of them. When Tahitians began competing in the Molokai Hoe in the mid 1970s - and winning - analysis of ‘their’ stroke has been omnipresent. My personal study of Tahitian technique is well documented in my books and follows on from the studies made by the late Tommy Holmes. All in all it’s a complex issue - but through an understanding of the evolutionary phases of technique in line with paddle development and the influencers at play, it’s clear the Tahitian Stroke is in fact an amalgamation of borrowed concepts. From paddle designs originating in different regions of the world, mixed with differing approaches to the stroke in terms of length, depth, stroke rate, leverage ‘moments’, borrowed and adapted to suit the nature of the Tahitian Va`a, Tahitian Waters, races, heat, humidity, physiology and ability the very idea of a Tahitian Stroke is indeed something of a falsehood as you can relate it back to prior use - not by comparing mens crews, but in fact by relating back to some women’s crews. The one contribution we know to be purer than most is the superior nature of the Tahitian Va`a which have been permitted to evolve without restraint - so good in fact, Tahitian / Hawaiian collaboration was effectively banned in 1979 by the HCRA in Hawaii. We will long continue to marvel at the Tahitian for what they bring to the sport and how they are able to adapt and morph continually to move over water via the paddle in a way that remains sublime and inspiring and the yardstick by which we can all aspire. Pushing ‘DOWNWARDS’ with the ‘TOP HAND’ has been advocated for a very long time. My books record this 20 years ago and as OC National Coaching Director for Australia for 6 years with Chris Maynard, we advocated this relentlessly. Why then is this now been considered a Tahitian thing as it seems to be suggested? I would argue in fact, Tahitian’s have observed the likes of the Australian’s and other top crews and have gone on to adopt this into their contemporary stroke. Worryingly and central to any analysis, there is a consistent disconnect between the tool of choice Tahitians use (the paddle) and the technique they apply. In the late 90s, many crews adopted the use of double-bend paddles, the thinking being - Tahitians use them - this must be part of the secret. Ultimately no rationale dissection or emulation of the so called ‘Tahitian Stroke’ or any other stroke type, can be deemed legitimate, without consideration of the paddle used, whether straight, single, double or quad. It matters - and it goes a long way towards determining the biomechanics at play and how it is interpreted. Tahitian crews have for many years changed sides on 9-12 strokes - this is nothing new. They have always put more focus on the rear leg than the forward, for drive backward to the canoe. This is due to power delivery from the top hand being downward, then momentarily forward, so it makes sense to transfer drive to the rear foot. Their is no such thing as the ‘Tahitian Stroke’ post 80s - merely a stroke which is a hybrid of many differing influencers which they have adopted and adapted to suit. Tahitians are fantastic observers and learners, seeking influences from nature and from what they see around them and at times beyond their shores. This is a key factor in making them fast - ‘open mindedness’. V6 and V1 or more closely aligned than OC6 and OC1 with regards to transference of technique. V6 and V1 have seats higher than the feet so as you can get over the stroke and engage the legs. OC1s have a seat near level to the feet, making stroke technique significantly different. Therefore be careful when moving between craft - you will need to adapt. Tahitian’s have long since stopped the idea of ‘big twist and reach’ phased out in the early 90s and therefore this is nothing new. Tahitian’s have never advocated paddling with locked arms or that they are hyper-extended when paddling V6. "Use of a double-bend (S-bend) paddle, places emphasis on downward drive + pull generated from the lower arm + mid-way through the power phase the paddler actively pushes forwards momentarily with the top arm, when the blade is near vertical”. THIS FLIES IN THE FACE OF ALL THAT YOU HAVE HEARD . . . but this is the special bit of information that is missing and indeed provides the relationship between the use of the double-bend (S-bend) paddle and the Tahitian Stroke. 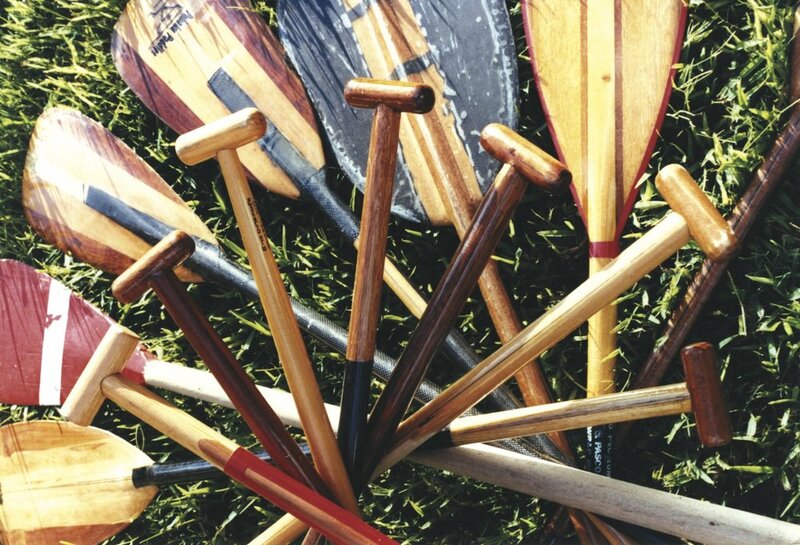 From the moment Tahitians arrived in Hawaii in 1975 they dominated the Molokai Hoe, using paddles of the time; straight shafted, no handle grip, heavy water-whackers, traditionally used by all participants, until ‘Blazing Paddles’ from Illinois USA took part in 1978, breaking tradition, using single bend, top handle gripped, shorter river paddles, storming home to victory. The Red Blade paddle is from the first winning Tahitian Team in the mid 70s before a series of other victories. Straight shaft, no handle and over 70” tall. Significantly, Tahitians even at this time, had a faster stroke rate than that of Hawaiian crews. Shout-outs of disqualification were over-turned, when a ‘handled’ ceremonial burial paddle was revealed to exist in Hawaii’s Bishop Museum. What was evident - their paddles had contributed to lessening fatigue and maintaining good form for the duration of the race, beyond the merits of the crew’s athleticism. These evolved paddle design features of the shaft, although aimed at improving comfort to the wrists, resulted in leverage benefits by default and subtle changes in paddling techniques evolved as a consequence of their use. In Tahiti, they were immediately converted and began their experimentation process. With the introduction of river canoe paddles into the Molokai race of 1978, the goal posts moved in respect of outrigger canoeing stroke rates and paddling techniques Pacific-wide in one giant fell-swoop. The consequent deconstructing of the paddling stroke in Hawaii, Tahiti and California in particular, was to become a complex undertaking especially where cultural dogma was concerned. Traditional outrigger paddles had determined the limits of paddling technique and stroke rates, now the gloves were off . . . When the Australian’s entered into the sport, things were to radically change. A country not bound by traditional constraints in respect of which paddles to use, they used laminated, single bend, short, handled paddles and their approach was aggressive, with attention to a high stroke rates emulated from paddling and racing Surf Skis. They were at the time the fittest ocean athletes of their time. Australian’s did not have to deconstruct traditional OC paddling technique and they began with a superior paddling tool and mastered it without hinderance. Meanwhile in California a similar story unfolded, while Hawaii was slow on the uptake, due to cultural restraints. Contemporary Single Bends Brought Immediate Benefits. Increased potential for extra reach, the blade can remain vertical for longer during the power phase, there is a lessening of drag at the end of the stroke and reduction in ‘pull down’. Stroke rates increased, the lower wrist was at a more ergonomic angle and paddlers could conserve and reserve energy for paddling using less for simply exiting and recovering the paddle. Historically, the late Eugene Jensen, from Minneapolis, is credited with inventing the single bend-shaft paddle as early as 1971. Then in the 1980s, Brad Gillespie a well known paddle maker, from Webster, N.Y., went one step further and devised a double-bend paddle for his wife, who had suffered an injured wrist which helped reduce the strain on her sore joint and lessened the pain. In respect of the double-bend, many dismissed the concept as a gimmick and marketing ploy, even if the ergonomic benefits appeared to have gravitas. Even today, many makers remain neutral in their beliefs about specific gains in performance between the shaft designs. With the passing of time, use of single or double bend paddles, have led techniques to develop to suit, having subtle yet different applications, so as switching from a single to double-bend or vice-versa, is not just a matter of switching paddles, but adopting a differing paddling technique, no more so, when attempting to replicate the Tahitian paddling stroke. Sound technique is but one factor of the stroke. Understanding the differing ratios of ‘Length of Recovery to Pull Phases’ - is what edges crews and paddlers towards mastery of efficiency, in using differing gearing, used at different times, to achieve different rates of travel in relation to energy expenditure - ultimately using differing energy systems and leverage advantages. ‘Reach’ - is a catch-cry we hear a lot in crews with emphasis on long reach, early exit - but as a crew, you will need to have more than this in your gearbox. Pre European contact and the legacy that followed post Missionary intervention, suggests both the Hawaiian Wa’a and Tahitian Va’a Stroke were defined as - super long out front and super long out the back. It was in essence a 1:1 ratio where pull through, was as long as the recovery phase. Stroke rates were super slow in the order of sub 30-40spm, on account of the clumsy nature of solid timber, super long, handless paddles. The Tahitian stroke was always ‘smoother’ due to low freeboard Va`a and only paddling within lagoons and bays. By the time Tahitians arrived in Hawaii to compete at the Molokai Hoe in 1975, they had quickened their stroke rates to be very much higher than the traditional Hawaiian stroke. They had now in their repertoire, a shorter stroke out front and out the back - significantly their blade shapes had changed to that of a Teardrop shape, so as the area of the blade was larger at the tip, narrowing to the shoulder. Overall these paddles were smaller and lighter and permitted application of their new stroke. The ratio remained near 1:1 in pull to recovery, but stroke rates were high at 65-70spm in comparison to Hawaiian 42sp. Typically, they paddled smoothly with minimal body movement. 1975 - Tahitians reduce blade size, shaft length, increase stroke rate 65-75. Stroke is still long out front and out the back, BUT much shorter than Hawaiian crews who are still in the low 40s per minute. 1979 - Billy Whitford / Blazing Paddles Illinois USA introduce contemporary canoe paddles and contemporary paddling technique borrowed from river paddling and bring OC in line with modern day Olympic standards of understanding of canoe paddling. 1980 - 1990 A seminal movement away from traditional OC paddling technique followed and spread Pacific-wide. Aussie’s introduce new levels of fitness levels and athleticism in presenting professional waterman athletes and an aggressive high rating approach to the sport. After the 1991 win of Panamuna, ‘indigenous’ Hawaiians resigned themselves they would no longer win Molokai if the trend continued. It did, but it has been the Tahitian Teams which have gone on to dominate, which is consolation in respect of cultural ownership and representation. The contemporary Anglo-Hawaiian outrigger canoe stroke was to be characterised by a 2:1 ratio, whereby the recovery phase was ‘near’ twice as long as the pull phase, with origins stemming from Pacific Rim intervention from Australia and California (mainland USA) in particular. It required big rotation and reach - hyper-extension even to the point of paddling with near straight locked arms. The introduction of lightweight, laminated paddles (ultimately evolving to become hybrids) of short length and single bend, permitted higher stroke rates of an aggressive nature, with emphasis on drive downwards. These stroke rates were super high and nearer to 70spm of which the Tahitians (Faa`a) observed and took note when Outrigger Australia won the Molokai Hoe in 1991 and Panamuna Australia in 1992. Mid 90s Hawaii - this mechanical, locked arm approach to OC paddling was commonly adopted - and ultimately ridden of . . . many SUP paddlers paddle in this way (?) - this encourages the blade to ‘trip’ over soon after being vertical if you fail to rotate in line with the canoes rate of travel up to the blade - it is an altogether far less free-flowing stroke. Fuelled by observing the Australians, Tahitians were now focusing on increasing strokes per minute. Some 20 plus years ago, I noted Tahitian crews were still utilising a 1:1 ratio (not the 2:1 as had been used by the Australians et al) which accounted for their super high stroke rates. I also noted very short calls between ‘Huts’ - as low as 10 per side. They were exclusively now using double-bend paddles in preference to single bends. This 1:1 ratio, was short out front and short behind, affectionately termed by Hawaiian paddlers as ‘Chilly Dipping’ on account of how it appeared. Short, fast, explosive - the stroke relied upon minimal body rotation, drive down with the top arm (but not as aggressive as say the Australians) then a short push forward with the top arm, when blade was vertical (to take advantage of the crank in the upper bend of the double-bend) and characterised by a relatively square recovery - lifted upwards and carried forward with minimal feathering. Stroke rates were 70 spm + - upward of 80. Historically, Tahitians have been radically modifying and fine tuning their paddling techniques, paddle choice and design, in sync with Hawaiian development through the 80s and 90s. The outcome being, Tahitians preferred the double-bend over the single, a paddle with greater flex together with a larger blade area. These factors of paddle choice have widened the gap between contemporary Tahitian and Hawaiian paddling techniques. Mid 90s Tahiti - A very different approach - PUSH IS ONLY ADDED WHEN THE BLADE IS VERTICAL - NOT AT THE CATCH, less emphasis on push down (compression) at entry, but still present. Less body rotation, greater use of arms, NOTE FOREARM IS HORIZONTAL OVER WATER. A short, powerful push forwards using the trapezium and triceps muscles can generate a powerful force. Hanz Salmon was one of Pirae’s finest strokers during the years in which they dominated. Classic use of the double- bend paddle; top arm bent downwards at the elbow, poised to push forward when the shaft is vertical, lower arm is bent and already pulling as body unwinds at a point where many paddlers are inclined to back off. This is combined with a powerful pull of the lower arm, using the smaller forearm and bicep muscles. Upper elbow ‘down’ - lower elbow bent - forearm horizontal to the water, top arm poised to push momentarily forwards in combination with pull from lower arm and some torsional rotation. Tahitians went on to develop a 1:2 ratio for super long, hot, flat water races, which relied upon a short, snappy recovery, followed by a long and now slower, less aggressive stroke, with long pull back. This suited the nature of their waters, the high humidity and long duration of many of their races. The stroke rate is very much less at this ‘relaxed’ race pace of under 70 spm. Little rotation remained prevalent and arms were not hyper-extended and locked during the pull phase. 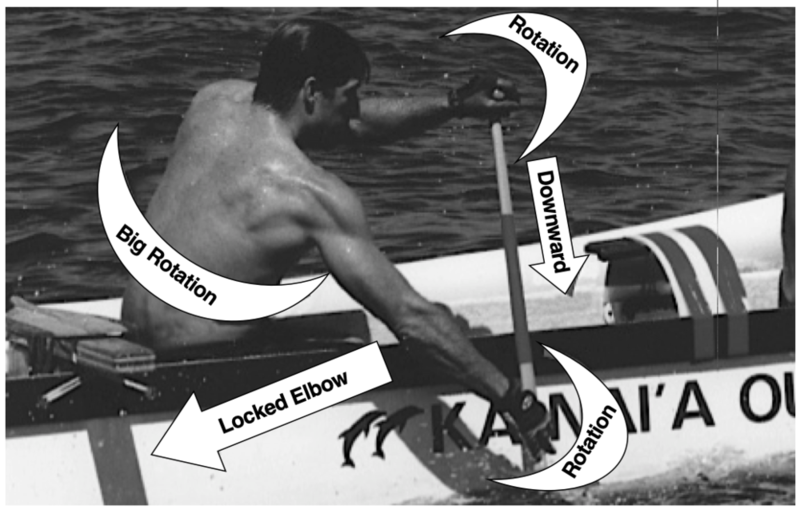 Driving downwards with the top arm was now replacing some of the propulsive power previously created from pushing forwards with the top arm when the paddle was vertical. Note: A fractional ‘pause’ at the end of the stroke increases the duration of the blade time in the water - but not the ‘length’ as such, hence it qualifies for a 1:1 ratio, not a 1:2. NOTE: Before attributing this to Tahitians - I spent many hours assisting Lisa Curry Kenny, with both her Panamuna and Mooloolaba OCC Australia crews beginning in the late 90s. I can say with certainty, Lisa advocated greater rotation through the stroke and increased blade time in the water, so as it looked as if there was a ‘pause’ at the back end of the stroke and that the pull was now past the hip. Indeed a common drill of ‘ballet’ was to pause momentarily at the end of the stroke at the point of exit, whereas mens crews would do the same drill reversed! Incredulously, this is what we are now seeing with the Tahitian men’s crews. The only key difference, the ladies used single-bend paddles. It was in total contrast to the way our mens crews paddled with the 1:2 ratio and high stroke rates and it was tempting (as a man) to want to criticise and change it so as they paddled like us guys. But Lisa knew what she wanted and what worked best for her crews. Credit to her for adapting this technique. It worked and they have the trophies to prove it. This is a case of MEN overlooking what women’s crews are doing in adjusting their physiology to suit. 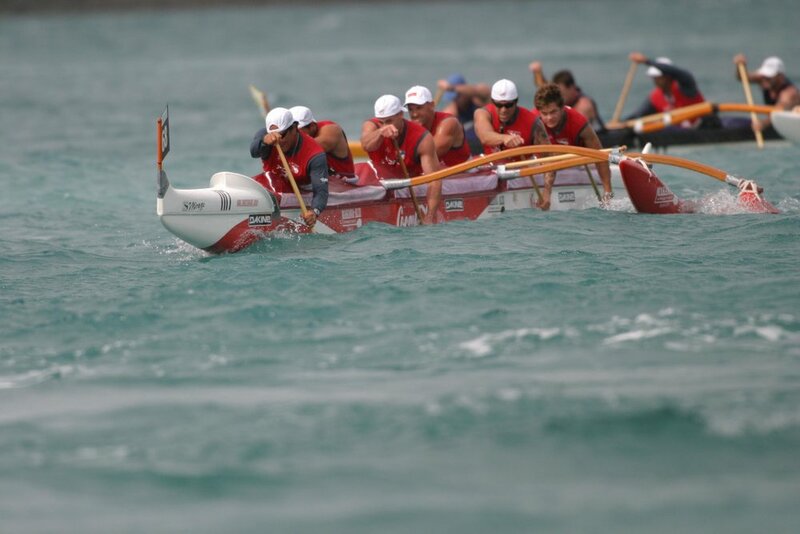 This is a very energy efficient way of paddling and it was indeed being used before Tahitian men’s crews adopted it. Tahitians have clearly adopted this variation, not created it, which reverts in part back to traditional ideas of long out the front, long out the back, with a slowing of the stroke rate. Using contemporary S-Bend paddles, the stroke is super relaxed and relies upon length (reach) out front and some degree of push behind the level of the hip maintaining a near 1:1 ratio of the past. The stroke rate has further slowed but not less than 62 spm thereabouts. The emphasis is on the push (drive) downwards at the front of the stroke while still retaining only a small element of ‘push’ forward with the top arm as the paddle moves past vertical when using the S-bend. Little rotation remains prevalent and arms are not hyper-extended and locked during the pull phase. Indeed the arms are engaged in the process, in being bent. It is this final contemporary version which is being focused upon and being given the term ‘Tahitian Stroke’ when in fact, it is but one variation which they call upon when required. The critical issue to note, is that crews need to have a variety of relative ratios of stroke, used for differing situations. Mastering any particular ‘one’ - is not enough. Of course, advocating a singular technique, suggests we paddle in a singular water and wind state - we don’t. Tahitians will use any combination of ratios in order to blend to water / wind states to maximise efficiency. Downwind, you will see them use a 1:1 ratio, short out front and out the back. In flat water they may use 1:2 and given the nature of many of their races (long and hot) this ratio and ‘new’ mechanism for paddling, makes complete sense. In the clip above you will see Shell Va`a using their fast 1:1 short out front, short out the back for fast burst of speed and also the longer version of it; long out front, long out the back when maintaining sub-max pace of maybe 75%. V1 paddling, perfected by Tahitian paddlers, necessitates the paddle is often repeatedly pulled (pushed) beyond the paddler’s hip in order to add in a steering stroke. This then seems plausible that it has migrated into V6 crews. The 1:2 ratio of paddling, is relaxed in comparison to the 2:1 ratio, even though the paddle spends longer in the water. Long, hot, flat water paddling characterised by many Tahitian races, suits the technique and again, provides some clues as to how this has evolved, with the latest 1:1 being super relaxed and as stated, suited the earlier pioneers such as Lisa Curry Kenny’s crews. A double bend paddle used for controlling and paddling a V1 (rudderless) craft, is a superior tool over that of the single bend. The additional bend further up the shaft towards the top hand, provides critical added leverage, when executing a steering pry stroke at the end of the pull phase on the left or right and other subtle levels of paddle control required to control the rudderless craft. All Tahitians who are paddling in V6 also paddle V1 - it’s mandatory - and having adopted the double bend in preference to the single bend, Tahitians have gone on to master its use and adapt it for V6 paddling. Check out Steevy Boy Teihotaata Super Aito winner and how he uses the crank in the shaft. Below, from our V1 book an insight into using the double-bend for steering - an interesting fact - the late Tom Connor (11 time winner of Molokai`i Hoe) sometimes steered OC6 with a double-bend on account of his influence from his association with Tahiti . . .
Women and the Double Bends - A Good Match? Incredulously, this is rarely taken into account. It may surprise you to know, many Tahitian V6 Vahine crews, preferred to use single bend paddles for many years in the V6 crews and indeed, some still make this choice. Because double bend paddling technique requires power from the upper region of the trapeziums and deltoids and greater pull from the lower arm, this tends to be better suited to a man’s basic physiology. In a sense, power to the blade is easier to generate by ‘weight and rotation’ in using a single bend. Today however, we see many women’s crews using double bend paddles, for better or worse. The single bend paddle, is more reliant upon use of body weight 'over the stroke’ which = compression through the body to the blade and this is reliant on a % of torso weight, easy to apply in combination with twist, which = torque - to ensure smoothness of power delivery to avoid ‘bobbing’ thereby driving the hull downwards. Although male Tahitian crews adopted, perfected and used double-bend paddles in V6 and V1, many (most) vahine remained using single bends in V6 - only using them in V1. ”No”, is the simple answer to this, especially if not used correctly. It will certainly give you added control in a V1 and this applies to male and female paddlers, regardless - and added control by default, will get you from A to B faster. That Tahitian crews are fast using this paddle, it’s not a guaranteed indicator that it is a superior stick, simply different. More Technical to Use than a Single Bend? The added bend, kink or crank within the upper part of the shaft towards the top hand, makes this shaft type more technical in respect of getting the most from the angles within the shaft. Using the crank and its mechanical advantage for steering a V1, becomes very clear and obvious in respect of the steering component, but when simply executing the forward stroke, it’s less obvious. The earliest forms of this paddle, featured a definitive ‘crank’ which was created by simply making a single bend paddle with bend at the neck to blade, the upper shaft was then ‘scarfed’ reversed and simply laminated back to the shaft, so as to make the conversion. The angle was such that an ‘aggressive’ amount of leverage could be generated from this fulcrum point. Note the acute rake back of the older styled / original double-bends. Over time, this manufacturing technique, was replaced with the use of ‘jigs’ so as the upper bend now formed part of a continual curve. This was not done for any improvement of mechanical advantage of advancement of design - it was simply a solution to mass production and more’s the pity as the old school way of making the double-bend created a far superior stick which gave you a more powerful fixed fulcrum point. The arrival of the S-Bend in the mid 90s onwards, has slowly pervaded the market, not because paddlers wanted this form of bend, but largely because makers found it easier to simply use a ‘jig’ to bend the laminates to shape during the lay up and glueing stages - sometimes using steam. Mechanically speaking, S-bend paddles, have no singular fixed fulcrum point, but rather one that is progressive so as the fulcrum point ‘shifts’ dramatically in use, which makes the S-bend demonstrably less effective in real terms and not as positive or accurate a tool for adding in the ‘push’ element. Some designs feel somewhat ‘wayward’ in use. Nevertheless, the better ones, still offer a degree of mechanical advantage and remain central for use in paddling V1 craft and V6 crews. With the introduction of the double-bend shaft, to further improve comfort, unintentional benefits were inherent in the design. The Tahitian stroke, which uses the double-bend paddle, is the most definitive example to use as our yardstick, to which they have moulded their technique and perfected its use as a tool in the application of their technique. The top hand can be kept further back being as the handle / grip, is angled back toward the paddlers so as to be angled upward and backward, while the bend that exists three quarters of the way up or so, is referred to as the ‘crank’ and with good reason. Additionally a shorter overall paddle length can be used on account of the upper shaft being angled and with less emphasis on drive down. In real terms, this paddle type provides a ‘mechanical advantage’. A well designed double bend or S-bend, permits the crank or fulcrum point to act as an additional lever, in providing drive and power to the blade, whereby the paddler mid-way through the stroke can momentarily push forward with the top arm in order to use the crank as a ‘momentary’ lever. When using double or s-bends, the blade is carried out marginally sideways away from the va`a, lifted upward to avoid ‘push’ and drag at the end of the stroke and carried forward to the point of entry, so as the recovery incorporates less feathering and a squarer recovery motion. The outrigger stroke, from California to Australia, retains greater feathering and a lower arched recovery. Tahitian paddles are made with a degree of natural ‘spring’ or ‘flex’ due to the timbers used. The ‘recoil’ provides and assists quick recovery rates and provides an encouraging ‘feel’ during the power phase enhancing a feeling of rhythm and timing. Mixing shaft angles and types within a team canoe, compromises uniformity of paddling technique and power bands. Worse still, many paddlers use single bend paddling technique, using double bend paddles. At the very least, crews need to be using ‘the same sticks’ the only variant possibly being blade width and paddle length, but the angle of the dangle matters and how you use it . . .